Do you think your insurance policy has your property protected from life's many mishaps? That those premiums you pay every month guarantee you the help you need when you need it? That your insurance company is a benevolent entity that strives to pay claims fairly and promptly? Think again. Your insurer's main objective is not to protect you; in fact, insurers often try to avoid paying justified claims. 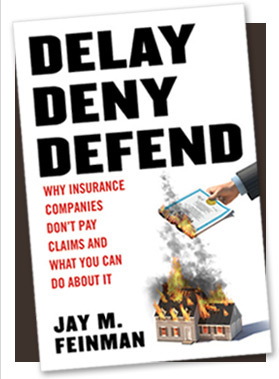 Today the name of the game is delay, deny, defend: to improve their profits, insurance companies delay payment of justified claims, deny payment altogether, and defend their actions by forcing claimants to enter litigation. "You pay a lot of money to insure your home and automobile, expecting damage claims to be paid promptly and fairly. That is no longer likely, as Feinman reveals in clear language. His advice on what to do when you file a claim, and how to reform the industry, make this book an essential in every family library." "Jay Feinman pulls back the curtain to reveal how insurers are systematically and deliberately squeezing America's consumers. Feinman does a masterful job, providing insightful analysis of the property claims process with timely prescriptions to protect consumer rights." "As a trial lawyer fighting these battles every day, I can tell you that the insurance industry has mutated from a business that was bound by promise and contract to one of profit-through-deception. Feinman focuses the bright light of truth on an industry that, like the financial services industries it is tied to, has run amok. This is a book all Americans need to read." "Jay Feinman's book shows how, time and again, policyholders with legitimate claims encounter nothing but resistance from insurance companies, leaving people frustrated and angry, and sometimes, destitute. Luckily, he provides some great suggestions about how consumers can fight back. This book is a must-read for anyone who needs insurance to function-and that's everyone!" "Feinman explains how America's premier insurance companies systematically rip off consumers. Do not settle your auto or home insurance claim without reading this book---you could avoid losing hundreds, thousands, or even millions of dollars that you are owed."